See our Projects Gallery for examples of student work! Foundational Classes: Drawing, Painting, Sculpture, Ceramics: These classes are the bases of every Creative Hands offering except for specialized classes in Ceramics & Pottery Wheel or Drawing & Painting. We believe that most young artists gain visually when they are able to jump between two and three dimensions, an activity that increases their knowledge of how objects are perceived in space. Since a challenging project is always provided in the various mediums, kids gain confidence as they see how, with the right techniques and quality materials, they can make beautiful things from their imagination. From year to year the projects change, stimulating and encouraging growth (especially important for kids who return year after year). Ceramics & Pottery Wheel: Get introduced to the wonderful ways of working in earthenware and stoneware clay, both with hand-building projects and learning how to use the pottery wheel. Individual expression is stressed and a solid foundation in various clay techniques is provided with beautiful results-vessels, mugs, animals, frames (the possibilities are endless). Includes all aspects of clay work through to the finishing touch of glazing with traditional methods, acrylics, and crystal glazes. Geared for both beginners or more advanced as we work with an individual approach. Drawing & Painting: An ideal class for those motivated young or older artists who want to work primarily in two dimensions in order to strengthen their skills and master the techniques of creating an illusion in space. 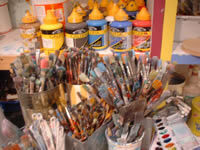 Fine professional-grade papers (with pencil, oil pastel, watercolor, charcoal, and dry pastel) are used as well as acrylic and oil on canvas. Drawing: This art fundamental provides a foundation in the ways and techniques of successfully rendering an original idea through line, composition, shading, and blending with particular drawing tools (pencil, colored pencil, conte, charcoal, and pastel-both oil and dry) on professional-grade paper stock. Painting (Acrylic & Oil): From an original idea in drawing (after inspiration from the masters and contemporary artists) to its completion on canvas, acrylic painting is a highly enjoyable process where students learn how to create different brushstrokes and textural techniques. Everyone learns that acquired skills, perseverance, and patience (and a lot of fun!) help to achieve a beautiful work of art. Art 3, 5, 7 & 8 will incorporate an opportunity to also experiment with water soluble oils. Art 2, 4, & 6 will primarily be using acrylics and watercolor as paint mediums. Sculpture: Artists both young and old love being able to manipulate forms in space with the 3-dimensional. While highly enjoyable, the process of creating sculpture also aids in understanding how objects are perceived in space, which in turn benefits the knowledge of working with the 2-dimensional illusions of drawing and painting. Materials here include wood, wire, plaster, found objects, clay (both kiln-fired and air-dry as well as sculpy clay) and papier-mache. In papier-mache classes, skeletal structures for plant and animal forms are built out of recycled bottles and wire, which are then stuffed and covered with newspapers. In our opinion, the best part is applying the messy adhesive to newspaper strips to build up layers of mass on the forms. We finish by detailing with assorted objects such as glass or sculpy clay "eyes" and colorize with adhered tissue papers and paint. All of our sculpture classes provide intensive learning through this structural, tactile medium which all young artists love.